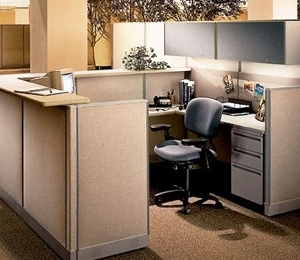 Are you in need of office cubicle solutions for your business’ office space? If so, the massive inventory at ROF is certain to have what you are looking for. Our cubicles are high quality, fully customizable, available in specific dimensions, and offered at a wide variety of price points. Since our company’s founding in 1991, ROF has been helping businesses from coast to coast furnish their offices with durable, stylish office furniture; and providing cubicle solutions is just the beginning. Whether you need cubicles in just one part of your office, or you need to completely outfit an entire building, we can help. We have cubicles of almost any size configuration and style, so you can be sure the order you place with ROF will perfectly fit your office’s available space and existing décor. And at ROF, we appreciate and understand that your bottom line matters. It is important to us to be able to accommodate an assortment of budgets, and that’s why we offer used, refurbished, and new office cubicles. Contact ROF today to speak with an office furniture expert. We can even provide free cubicle design and layout advice to complete our cubicle solutions service, so you can rest assure that your investment will be just what your office and employees need.